1994-96 Brevard County Manatees - Fresh Fitted Friday!!! We're wrapping up the second week of MLB's 2018 season however I'm showing no signs of slowing down with the inventory of minor league caps from Florida teams. 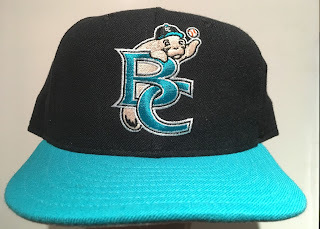 This week's cap is a Florida State League classic: a Brevard County Manatees cap from 1994-96. From what I've seen, this version of the cap with a teal brim is less common than the all black. For what it's worth, I've only seen it on cards from 1994. Usual suspects as far as sweatband tags from 1994 to 1996 are concerned. The black and teal batterman here makes me think of pure waters where Manatees may float and snack as they please. Graze on. I've mentioned this before but it's worth repeating that the peak level of my interest in minor league baseball came in the mid-1990's so it's no surprise that when the Portland Sea Dogs and the Brevard County Manatees showed up in 1994 with black and teal caps, I was sold on these teams immediately. The Manatees and Sea Dogs share a few special distinctions. Besides having similar design elements in their uniforms, they were two of the main anchors in the Florida Marlins minor league system from 1994 until 2001 and 2002, respectively. Their cap logos stayed the same during that time and the Marlins top prospects continued to roll through. While the Sea Dogs are still thriving in Portland, I'm sad to report that the Manatees are no more as the team swam inland to Kissimmee in 2017 and are now known as the Florida Fire Frogs. Paul Caputo wrote an excellent post about the Manatees on Sportslogos.net where I learned of a push for the Marlins to be called the Manatees but someone high on the food chain — not a shark; definitely not a shark — wasn't keen on the name so they bestowed the name to their High A affiliate, for which I'm thankful. In case anyone out there wants to retro this cap, the dimensions of this logo are 6cm x 7.5cm (W x H). This cap isn't for sale or trade however don't hesitate to reach out if there's something you like on the Trading Block and you are willing to part with any of the hats on my Wish List. Prince William Cannons - Fresh Fitted Friday!!!! Jupiter Hammerheads - Fresh Fitted Friday!! !